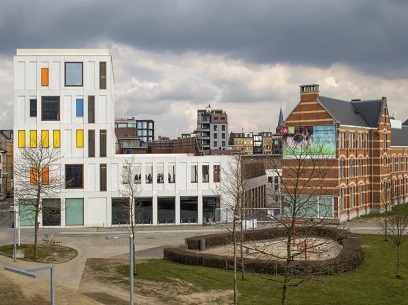 The German School is the winner in the Schools – Completed Buildings category. Image: World Architecture Festival. The German School is the largest civil architecture project by German architects abroad, and overnight it was named the winner of the World Architecture Festival in the Schools – Completed Buildings category. Located in Madrid, the school opened its doors to students last October. The Berlin-based Grüntuch Ernst Architekten architecture firm that designed it was praised by the judges for both the design and the environmental performance of the school. The World Architecture Festival is the world’s largest annual architectural event, drawing over 2000 participants to Berlin this week. The German School was recognised as an important site for cultural exchange, given it provides a special educational program during the day and theatre performances in the evening. On this site, the individual buildings – a kindergarten, primary school and secondary school – each frame an inner courtyard and take in a spectacular view of the surrounding landscape and snow-covered mountains. The common areas – the foyer courtyards, the cafeteria, a concert hall/ auditorium with 750 seats and the sports hall – connect the individual school buildings. In fact, each day all the children meet in the foyer courtyards before dispersing to their individual school buildings. An interesting feature of this building is the implementation of natural cooling through a subterranean thermal maze, which will ensure the building’s sustainable operation. To continue our celebration of Learning Spaces month here at Teacher, we take a look at the other projects shortlisted in this category. Miyakojima, southwest of Tokyo, is a very hot and humid area that is also susceptible to typhoons. Given this, the school building has plenty of shade, but also lots of open spaces to allow for ventilation. The building has drawn inspiration from the traditional wooden red roofing tiles from the region. Creativity is of high importance in this space, therefore the building features a studio and atelier for artistic pursuits. There is also a large playground where children can enjoy their free time. When an earthquake registering 6.3 on the Richter struck Chiang Rai Province in the North of Thailand, it destroyed 73 schools and affected over 2000 students. 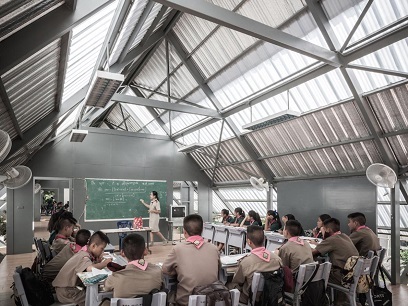 In the wake of this disaster in 2014, a post-disaster recovery program called Design for Disasters (D4D) was launched to design and build nine new earthquake resistant school buildings in the most affected areas. The project had some key design requirements – the building must be earthquake resistant, easily constructed by local workers and requiring as low a budget as possible. What’s more, most of the building materials had to be lightweight to reduce horizontal momentum caused by the weight of the building during an earthquake. The roof of the building is designed with a pitch higher than normal to shield the interior from monsoon rain, without having to have solid walls along both sides of the building. This approach also allows for fully opening windows along the rooms, creating good ventilation at the seating level. Flower pots have also been installed around the school to serve as a reminder to children that in spite of the harsh and cruel realities of caused by natural disasters, nature can also bring beauty and joy, every day of their lives. This project consists of a new campus catering for students in kindergarten, primary and secondary school. Essentially the building has two faces: a city side with higher building volumes and the tower, and a ‘softer’ park side with several levels. The school has planned to create a central lobby to connect these two faces. 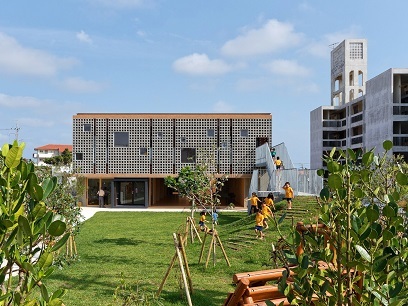 The kindergarten is oriented towards the inner area that offers more cover, while the departments for the older children are more open to the park and street sides of the project. Housing 680 students in a relatively small area, most of the roofs of the building will be used as playgrounds. 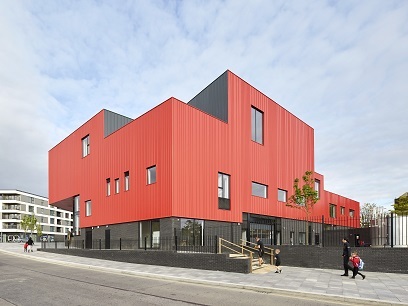 The building is considered a “passive school” because of its thick insulation, soundproofing, sun screens, a ventilation system with heat recuperation, and exterior carpentry with triple glazing. Catering for students aged four to 16, Plymouth School of Creative Arts is sponsored by Plymouth College of Art. This building has drawn inspiration from a department store, an art gallery and a studio/workshop – creating a series of dynamic spaces for teaching and learning. The open plan floors have encouraged teachers to experiment with different teaching styles, based on class groups of 60 to 100 students. The materials used for this build have been chosen to cater for the harsh climate, consisting of a simple steel frame with profiled concrete floor slabs, exposed to take best advantage of thermal mass to moderate the internal environment. On summer evenings these spaces are purged through the night time ventilation mode. The school also generates its own on-site electricity using photovoltaic solar panels on the uppermost roof. Tarawera High School is located in the small mill town of Kawerau, an area recognised as one of New Zealand’s poorest communities. 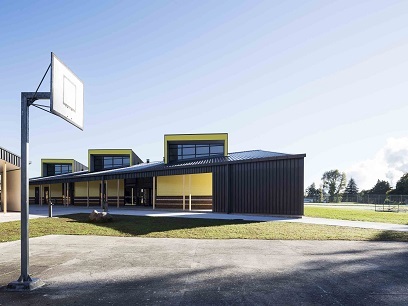 The architects involved in this project worked to improve the existing accommodation and provide new facilities, in line with the NZ Ministry of Education’s current model of Advanced Modern Learning. When they first began, the architects were faced with dilapidated buildings ‘that made no acknowledgement of the surrounding landscape, nor the cultural importance of the 90 per cent Maori school roll, as the Indigenous people of Aotearoa New Zealand’. Students now have open plan learning spaces that accommodate 90 people at any given time, an advanced modern learning environment and new building materials and technologies. They now enjoy buildings that open onto large veranda areas that can be used for outdoor learning or sporting activities. Features of the buildings include rain water harvesting and solar panels. The entire process was collaborative and encouraged community engagement. This German school has been designed as a solid structure with load bearing walls and two central circulation cores constructed in reinforced concrete. The design includes 'multifunctional training zones' that are seen as ideal creative learning spaces. The ground floor, which is used for music and performing arts, boasts generous learning areas that are all linked through a central foyer, while a top floor patio serves as an open air classroom. An interesting feature of this school is a pet zoo, which is minded by the pupils, along the west side of the school yard. 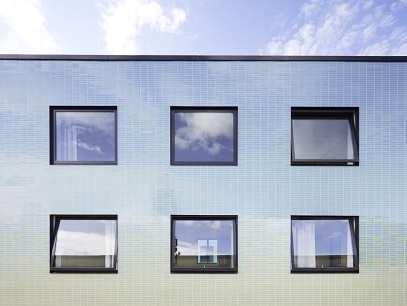 The colour patterns for the school buildings have been carefully considered, while the glazed tile surface serves as a reflection screen for varying light emissions and contrasts the coarse render surfaces. What’s more, a detailed and corresponding colour scheme has been applied to all interior surfaces, and functions as part of the school's educational concept for grade and age identification. To find out more about the World Architecture Festival, click the link. In all of the innovative architecture what thought is given to the acoustics of the teaching area? As a teacher, now lecturer it always amazes me that nobody seems to think carefully about acoustics in teaching areas - given that teachers nearly always have to use voice projection rather than microphones and speakers, it can make a huge difference to the teaching environment if acoustics are bad or the sound is dampened such that the teacher’s voice is not heard or worse still the noise when clas changes is so loud it becomes impossible to hear.